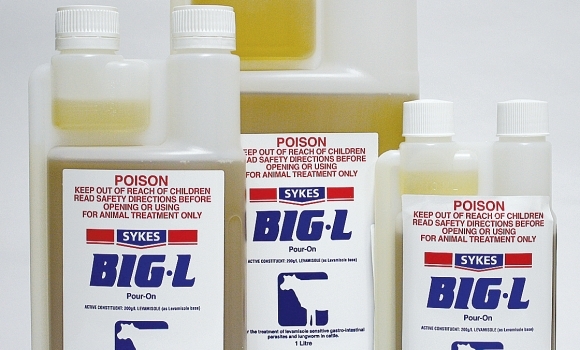 Sykes Big L Pour-On should be administered along with the backline of the animal (starting at the shoulders) using an appropriate applicator gun or using the pour on nozzle on the bottle. A representative sample of animals should be weighed before treatment either with scales or with a weight band. The dose rate to be based on the heaviest animal by bodyweight in each mob (cows, steers, calves, bulls). Do not overdose. Where there is a large variation in size within the group, draft into two or more lines based on body weight, to avoid excessive overdosing. Normal care should be taken with weak or pregnant animals. Overdose may cause animals to show temporary excitement, salivation or muscular tremors. BIG L POUR-ON may be used concurrently with pour-on products for lice control provided the products are applied to different parts of the backline. Apply 2.5mL per 50kg live bodyweight. See below for details of specific dosage volumes. Cattle heavier than 650kg to be dosed at 2.5mL per 50kg bodyweight. Always dose on a bodyweight basis. Are there any side effects to be expected when worming cattle? As with all cattle worming products, if overdose occurs, cattle may show temporary signs of excitement, muscular tremors or salivation. This will pass, and these are only temporary side effects. DO NOT use in lactating cows where milk or milk products may be used for human consumption. MUST NOT BE USED for human consumption.